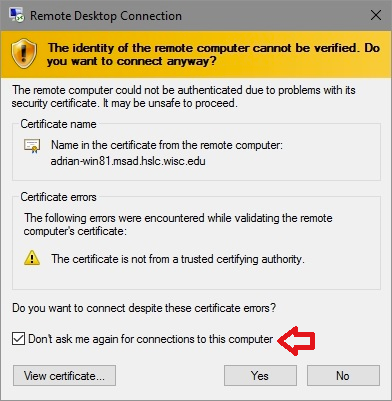 Instructions on how to use the Windows Remote Desktop client to remotely connect to an SMPH staff computer. - Click and run the WiscVPN GlobalProtect desktop app. - Enter the following Portal: uwmadison.vpn.wisc.edu with your NetID credentials, then click Connect. Note: To confirm that your are now on the VPN you should see Status: Connected in the GlobalProtect window. - Now that the VPN is connected, open and run the Remote Desktop Connection application. 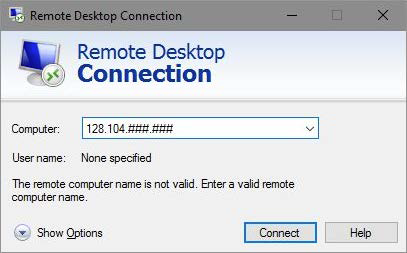 Note: The Remote Desktop App can be found, by clicking the Start Menu button (windows logo - taskbar), and typing "Remote Desktop Connection" in the search field. - Enter the IP address (Ex. 128.104.###.###) of the specific work computer you are trying to connect to. Note: Your work computer must be powered on for the connection to work. 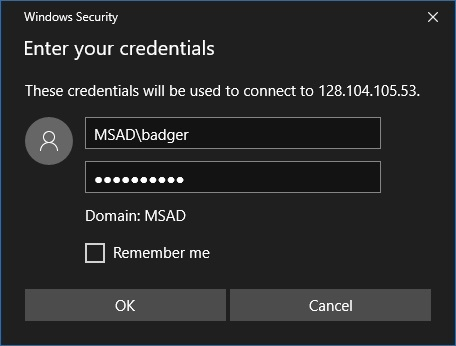 - Enter your MSAD network credentials (Work computer username and password). Note: Make sure you enter MSAD\ before the username (see below). - IF, you see the Certificate message, check the box next to “Don’t ask me again…” and click Yes. - You should now be logged into your work computer, via the Remote Desktop Connection window.